Boxers, Briefs or Boxer Briefs? There’s nothing more irritating than a straight guy in a gay bar. You try to pick him up and he immediately shoots you down with the dumbest response one can give: “Oh. Sorry. I’m not into that.” Not into that? You…you do know what gay bars are pretty much meant for, right? I’ll give you a hint: it’s the same purpose as straight bars, only gay. Not quite sure why that’s so difficult to understand. Which Gay Dating App is Better? 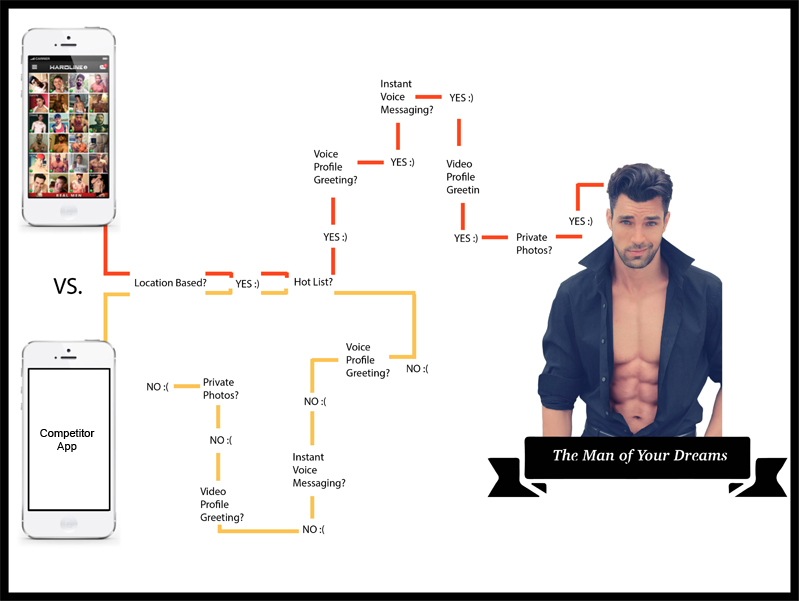 The number one question men ask themselves before trying a new gay dating app is “what can this dating app do for me?” When choosing between the Hardline Chat app and another that may or may not be a pretty big name in the gay app space, the number one things to consider are the features they each have to offer. Those features will be the difference between you finding the man of your dreams and well…not finding the man of dreams. While your still on the hunt for the man of your dreams with “Competitor App” —wet dreams included—a member of Hardline Chat will have already beat you to him. So download the app here, before it’s too late! If there’s one thing gay and bi men love, it’s a good plug. So here’s one for Hardline (See what I did there?!). Your twenties go by fast. They go by so fast, in fact, that you may not notice the changes that occur in your dating behaviours as you prepare to become a poor, poor old man. (Because let’s face it, we all know it’s over once you hit 30. Woe is us.) Balderdash, you say? Perhaps you should take a look at this list and see what resonates. Don’t get upset now. You were a dumb kid in your early 20s, anyway. Are You Giving Off the I’m Easy Vibe?